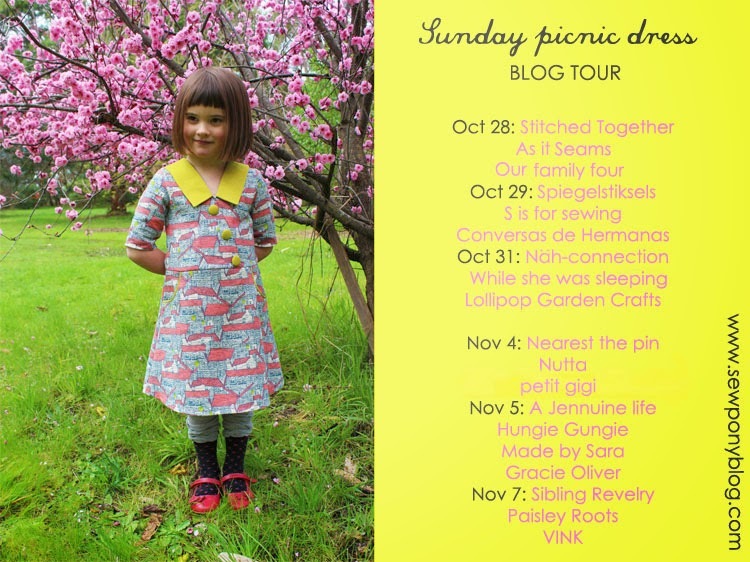 Today is the last day of my Sunday picnic dress blog tour. It has been great to see so many variations of my pattern and thank you to all of my customers so far!! I hope you enjoy sewing up your Sunday picnic dress!! I have three more bloggers showing you their versions! Emily, Karly and Linde. And as an added surprise, Marleen from Petrol and Mint has sewn up her first dress since the birth of her baby Emma and is sharing her Sunday picnic dress today too! Head over to Petrol and Mint to see! Emily blogs at Sibling Revelry and was one of my lovely testers. Emily's Sunday picnic dress was the first one I saw in the tester group and I was so excited! (You can see why by her picture?). She made the perfect dress and it is really such a thrill to see the very first garment made using a pattern you have created. 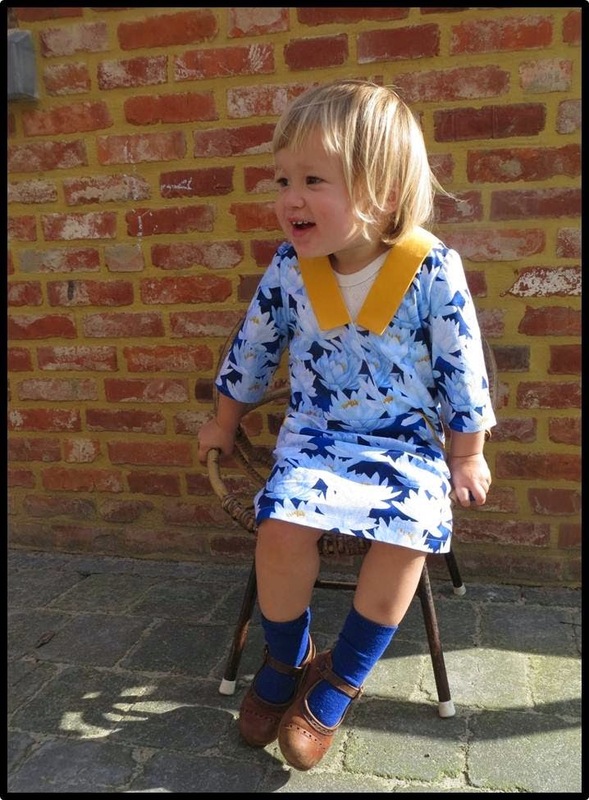 Please visit Emily's blog to see more of this lovely dress! Karly blogs at Paisley Roots and is a very busy Mum of five children! She makes loads of clothes for her children and her sewing is awesome! Karly won Project Run & Play last year and I can see why! 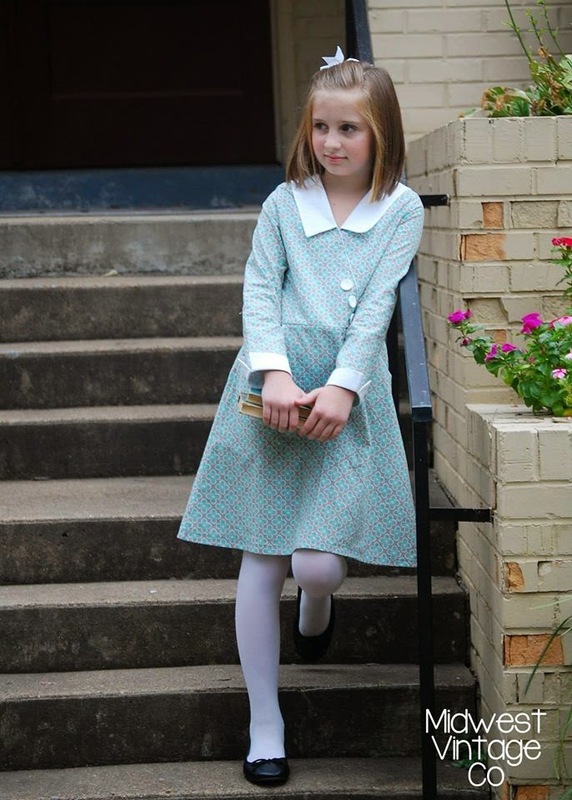 See Karly's mini Sunday picnic dress on her daughter Zoe here! 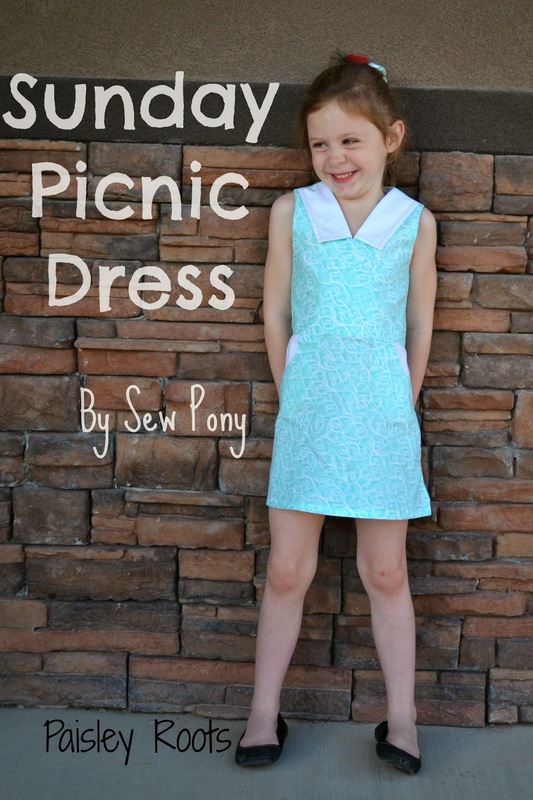 You can read why it is a mini Sunday picnic dress over at Paisley Roots! Linde blogs from VINK in Belgium. You might remember the origami collar I made on this christmas dress for Isabella? That was (with permission) copied from a dress Linde made, and that is how I discovered her blog, through this pin on pinterest. Since then I looked through flickr and google to try to find where Linde blogged from and I found VINK. Linde's sewing is amazing. So colourful, fun and usually with some retro style. I knew Linde would sew up a fabulous Sunday picnic dress. Acutally, Linde made two!! Go to VINK to see!! You can receive a 15% discount on your purchase of my new pattern with the code: SUNDAYTOUR15. You can purchase through my shop or through etsy (Aussie buyers can buy by direct deposit via etsy if you do not have a paypal account). A full description of the dress and some more more photos are on my shop listing. Thank you Rachel, Victoria, Erin, Nele, Ana Sofia, Rita, Annika, Jenya, Yeka, Renee, Shino, Jenn, Erin, Sara, Rachael, Emily, Karly, Linde and Marleen!!! You all did a fantastic job and I appreciate your time and talent! !